The BRE Datsun 240Z a few weeks ago reminded me how much I love old-school slide film. 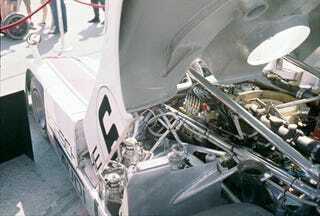 This is a 1972 Porsche 917/10 that I shot on Kodachrome in 2006. Could anyone else stare at this all day? Nice Bright Colors! Greens Of Summer! All The World&apos;s A Sunny Datsun! Random Trivia Department: In his book The Unfair Advantage, Mark Donohue tells of working with Bosch engineers to develop the fuel-injection pump for the first turbocharged Porsche 917. It was a long and drawn-out process, one made more difficult by the fact that both Porsche and Bosch believed the car to be perfect when Donohue first drove it*. From then on they used the expression quite a lot without knowing its real derivation. They asked me if it had enough power then, and I said, 'No. It will never have enough power until I can spin the wheels at the end of the straightaway in high gear.' They were aghast at that. They had never seen motors put out even as much power as we had. As they reached 800 horsepower, they literally burned out one of their dynamometers. By the end of the year, the five-liter engine was up to 880 horsepower, and the best 5.4-liter engine in 1973 was eventually good for 1190 horsepower. All the time they kept asking, 'Now does it have enough?' And I kept saying, 'I still can't spin the wheels all the way down the straightaway.'" Incidentally, if you haven't read the book, it's fascinating. Unfair is one of the most entertaining, wide-ranging, and informative motorsport books ever written. If you do nothing else with your life, read A) the chapter on how Penske made the Trans-Am Camaros work and B) the section on the turbocharged 917s. Fascinating stuff, all told by a humble, funny, and thoroughly charming guy. And I was born too damn late. *Light-switch boost, an on-off throttle, and 800-plus horsepower? Let's go with, er, no.